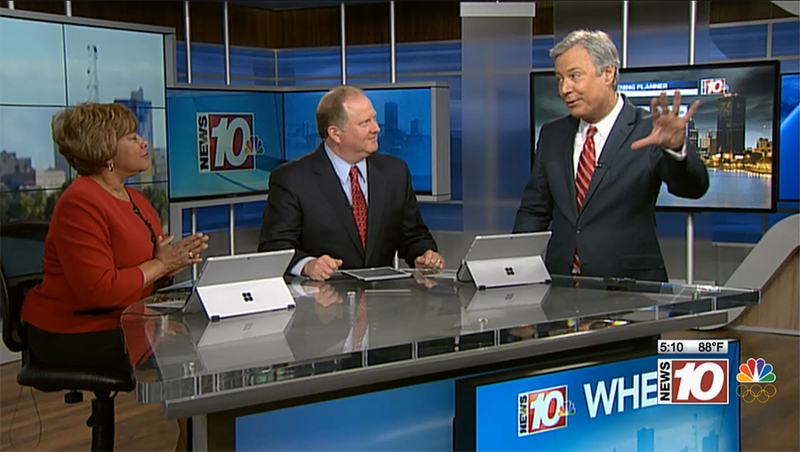 Upstate New York’s WHEC-TV, owned by Hubbard Broadcasting, debuted a new studio, dubbed the ‘media center,’ on Tuesday. The update marks the first time in 22 years the station has seen a major scenic change, which was completed by the team at Devlin Design Group. During the 6 p.m. newscast, the anchors bantered about the “very sharp studio,” which includes dark woods with cool metals. Backlit panels connect the various venues of the set, with patterning and plexiglass to add depth on-air. 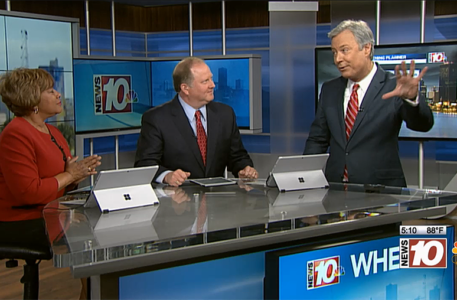 Technology wise, the design includes a 5×3 video wall behind the main anchor desk, a 2×1 monitor wall connected to the larger wall, a 90″ monitor and a weather touchscreen. The stations old anchor desk was donated to the Russell J. Jandoli School of Journalism and Mass Communication at St. Bonaventure University in Rochester.